Come On Ya’ll, Let’s Take A Ride! Thank you Coolio for the inspiration for my first blog title! I was motivated to start this blog because I would get multiple questions on the different methods/items I was using on my daughter, Emma. I never thought in a million years I’d be considered ‘crunchy’ as my hubby affectionately calls me nor started out that way. I’m guessing I turned out more opened minded than I thought possible for me and was willing to try new ventures. Don’t get me wrong, I know there are tried and true ways/ideas out there but my thought process is maybe there’s an alternative. I have had some influence from the members in my celiac support group here in Dallas along with a few first time mamas…for which I am grateful that my eyes have been opened! Without further ado here is the baby girl who has been my inspiration. 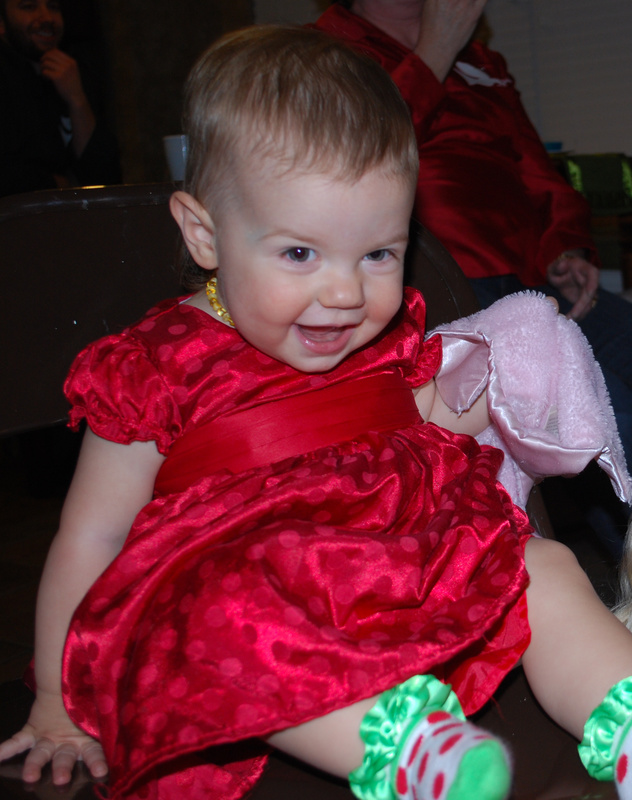 This is Emma at the celiac Holiday party held in our home in early December. It was quite a feast to say the least…gluten & dairy-free goodness, oh my! Any who, I hope you will join me on my new blogging adventure here in Crunchyville. Now let’s get this show on the road shall we?